Rudolph Hanamji, centre, is the chairman of the TT Pride Arts Festival Committee spearheading the five-week Pride celebrations. 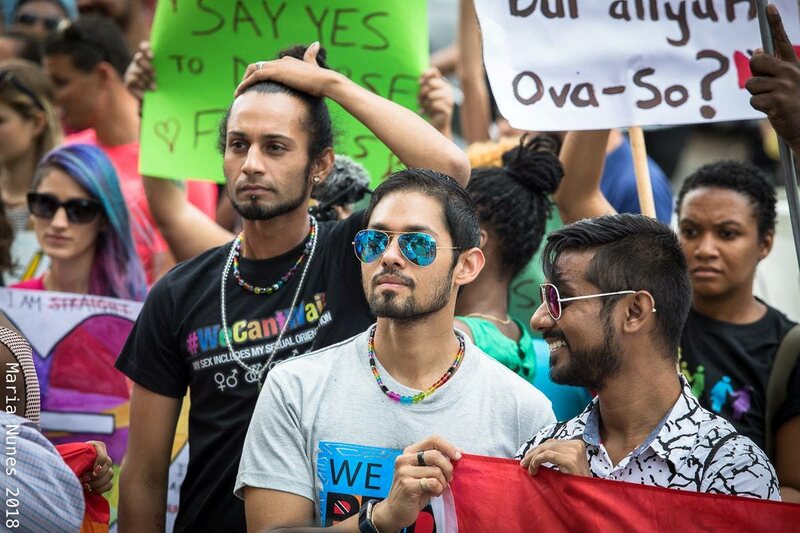 RUDOLPH Hanamji, organiser of this country’s first Pride parade last Sunday, yesterday welcomed Monday’s statement by RC Archbishop Jason Gordon in support of the LGBT community’s right to publicly advocate for their rights. In June, Gordon was among a group of six religious leaders, including Hindu and Muslim, under an umbrella group, RebuildTT, who declared their opposition to gay marriage, but on Monday he said the LGBT community had “legitimate concerns for their rights” which must be taken seriously in a democratic country. Newsday asked about a seeming softening of stance by the archbishop. Hanamji said, “We saw the missive and the different NGOs, we talked to each other. “We see it as a positive step. We were a bit surprised with that initial grouping of the religious leaders in a negative way. He said while leaders shift from position to position until they find their footing, the LGBT community would like to see some consistency soon. He said a leader cannot one time say he supports human rights, yet another time say he supports only certain human rights. Newsday asked about other religious leaders in RebuildTT. He said many LGBT people don’t feel represented by certain religious heads. Otherwise, Hanamji said the Pride parade was attended by 400 participants. Reply to "TT Pride welcomes archbishop’s statement"